While there are no rules in modern photography, at this Chateau Le Parc special day we had to follow the traditions of both the bride and groom's families asked us to provide a blend of classic and modern photography. There were lots of group shots and we were very happy to take them is these are an important piece of our service. Documenting the presence of the guests it's such an important event is crucial. Now, the couple is young and has no worries! However, in a few decades, the writing rooms children will want to see the images of people were not around us anymore. It is our duty as wedding photographers to do our best to capture the presence of the guests in the best light possible. 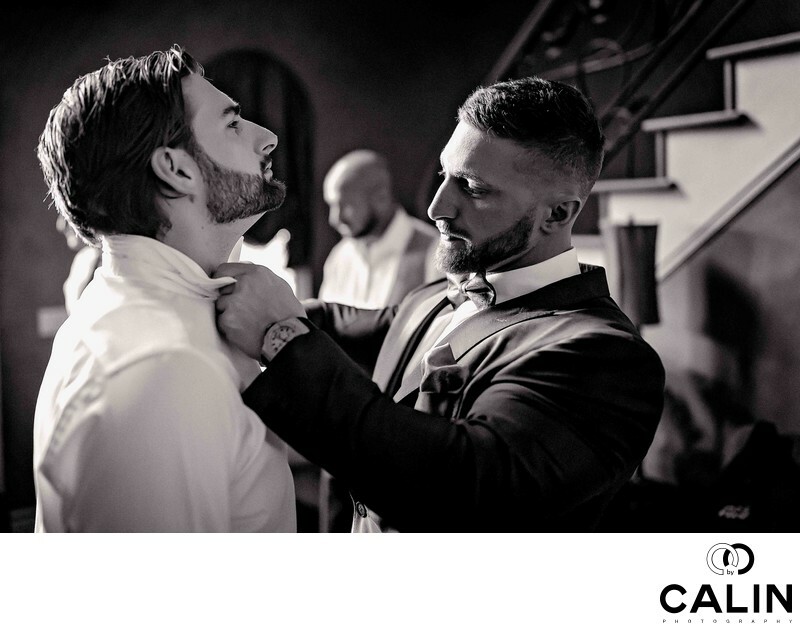 This image of the wedding album portrays the moment when the groom is helping the best man, his brother gets ready before the wedding ceremony at Chateau Le Parc. Because things were happening so fast on this wedding day, we didn't have much time to direct. Also, there were three videographers working around us so we had to be quick and do our best to capture genuine moments as opposed to directing and recreating those split-second reactions. In this image, the best man is placed on the left of the frame and the is on the right. That was a deliberate choice so that the light hits the groom from the left and he becomes the brightest part of the scene. To separate the subject I took this photograph at a very shallow depth of field. My Canon 85 mm F1.2 is a spectacular medium telephoto lens that gives me the reach and allows me to observe the action without intervening. My go-to camera was a Canon 5D Mark III, my workhorse at the time. From a compositional standpoint, there are elements that make this image stand out. First, the stairs running from the top rides towards the groom create a leading line directing the viewer's attention to the main subject that in this image. Second, the shallow depth of field isolates the isolates the subject and makes it pop. The darker background creates an additional layer of separation enhancing the power and dominance of the subject in the frame. The best man is looking at the groom which creates another virtual leaving line telling us is the main subject in this photograph. Finally, over the three people in this image, the groom is the only one wearing a jacket which makes him stand out. To give this image a photojournalistic feel and preserve its candid nature, I selected the black-and-white processing. After colour correcting the photograph cropping it and straightening the horizontals and verticals, I imported the image in Photoshop for additional processing. I prefer the dark shadows in the black-and-white pictures. Though shadows contrast with the highlights and make the image stand out. Finally, I added a selective vignette around the subjects and did some skin retouching.